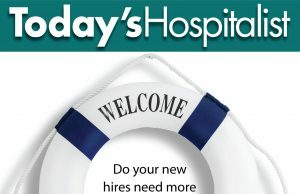 DURING A PRESENTATION at a conference on managing hospitalized patients last fall, Dhruv S. Kazi, MD, MSc, MS, a cardiologist at Zuckerberg San Francisco General Hospital and an associate professor at University of California, San Francisco, presented his top take-home messages for hospitalists about the diagnosis and management of acute coronary syndrome (ACS). STEMI, of course, is the “big bad” among ACS. Dr. Kazi spelled out its diagnostic criteria: ST elevations of 1 mm or more, with the exception of V2 and V3, which are 2 mm or more. “We believe ST elevations represent an occlusion or a critical stenosis in a large epicardial coronary artery such as the left anterior descending (LAD) or the circumflex,” he explained. These patients, he noted, benefit the most from early reperfusion, whether you give them thrombolytics or, more often, take them to the cath lab and open a vessel. ST elevations are also a marker of higher in-hospital mortality: While in-hospital mortality is 5% for all acute coronary syndromes, it’s 6% for patients presenting with a STEMI. But that figure is only slightly lower (4%) for patients who present with a non-STEMI, and mortality among these patients “catches up to STEMI patients within a year.” Mortality at one year after a STEMI or a NSTEMI is “nearly identical,” Dr. Kazi said, and one mistake he believes doctors make is to discount NSTEMIs. In the first case Dr. Kazi presented, a 62-year-old woman with diabetes and hypertension presented with nausea and vomiting, as well as 4 out of 10 substernal discomfort and 6 out of 10 abdominal pain. Her initial EKG was “characteristic of a left bundle branch block,” he pointed out. Dr. Kazi added that left bundle branch block was the “bane of my existence” as a cardiology fellow and the reason why more consults are generated in the hospital than for any other EKG. The primary challenge is not that the left bundle branch block is equivalent to a STEMI, which it isn’t, he said. Instead, the big problem—and his take-home message no. 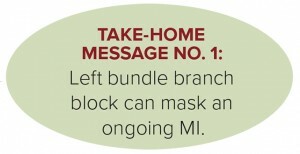 1—is that left bundle branch block can mask an ongoing MI. While a left bundle branch block can be caused by degenerative changes in the conducting system, it can also be due to an LAD infarct. When such a patient presents in the emergency room, Dr. Kazi said the key questions are: Do those symptoms represent a blockage in an epicardial coronary, and does the patient need to go to the cath lab emergently? 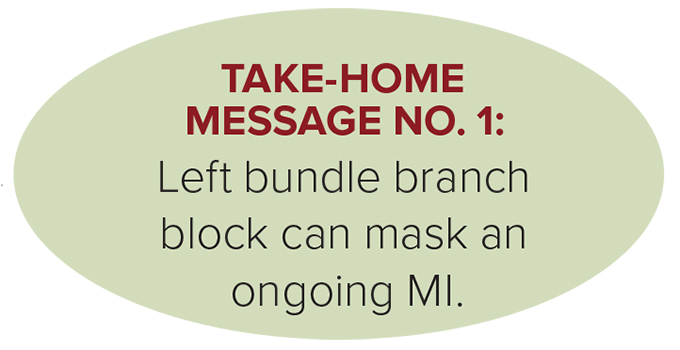 When someone who is hemodynamically stable and has atypical symptoms presents with a left bundle branch block, he asked the audience, what should you do next? 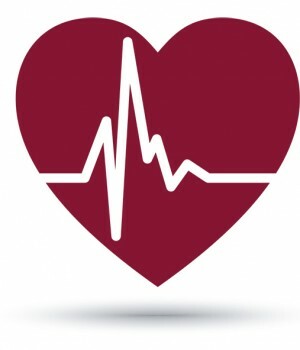 Getting old EKGs from the patient’s primary care physician or repeat EKGs in the hospital “can occasionally be helpful.” But because most left bundles are stable, he explained, serial EKGs aren’t really a good option. And a stat echocardiogram is seldom helpful because the left bundle branch block itself can cause wall motion abnormalities. Case No. 2: Are you sure it’s an NSTEMI? In the second case, a 68-year-old with obesity, hypertension, diabetes and a 30year smoking history was involved in a head-on collision. He is hemodynamically stable in the ED, with multiple fractures of the pelvis and lower extremities. But on hospital day 4, he develops shortness of breath and new 7/10 substernal chest pain. He is tachycardic, normotensive, sating 94% on 2 liters NC, and his EKG shows sinus tachycardia and nonspecific STT changes. A posterior infarct—which is one in the posterior wall of the left ventricle—can also complicate an inferior MI. In both these cases, ordering a stat echocardiogram can help with the diagnosis because you might see wall motion abnormalities of either the right or posterior wall. 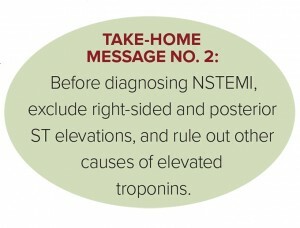 Say you find no ST elevations, but you do have a positive troponin. It is often tempting to skip this step, he added, which became his take-home message no. 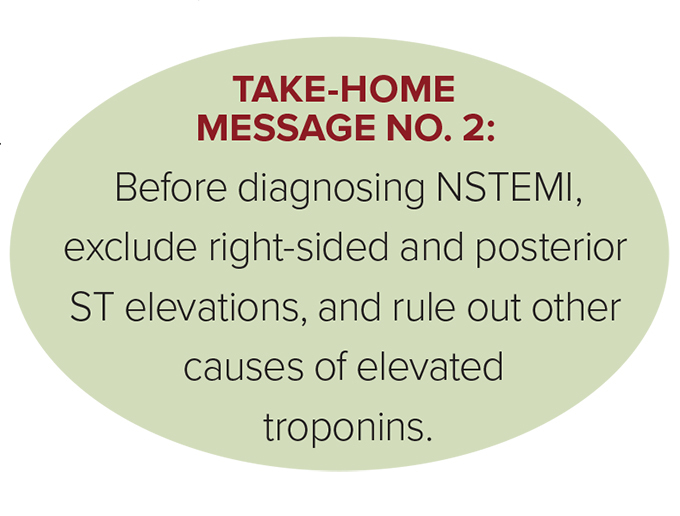 2: Before diagnosing NSTEMI, exclude right-sided and posterior ST elevations, and rule out other causes of elevated troponins. 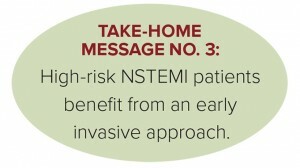 If after careful consideration you’re left with an NSTEMI, “you still may need early coronary angiography because there are high-risk NSTEMI patients”—his take-home message no. 3. (He defined “early” as within 24 to 72 hours.) 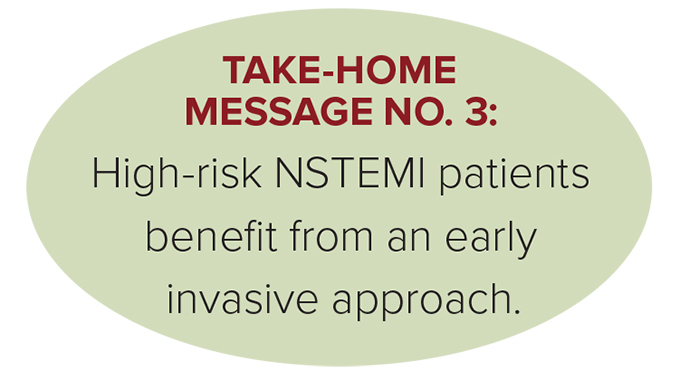 High-risk NSTEMI patients include individuals with ongoing pain despite antiplatelet and anticoagulation therapy, those with electrical or hemodynamic instability, and patients with high GRACE or TIMI risk scores. Case No. 3: Who needs dual antiplatelets? A 63-year-old man with diabetes who smokes a pack a day presents with chest pain that woke him up at 6 a.m. In the ED, he’s hemodynamically stable and free of chest pain, but the presenting EKG shows 2 mm ST depressions in II, III and aVF. (There are no ST elevations in the right-sided or posterior leads.) The troponin is 0.2 ng/dL. “You diagnose NSTEMI and initiate aspirin, statin, heparin and metoprolol,” Dr. Kazi said. “Coronary angiography the next day reveals a 60% lesion of the mid-right coronary artery and 50% in the LAD.” Because an echo shows that LV systolic function is normal, you decide to medically manage the coronary artery disease without PCI. 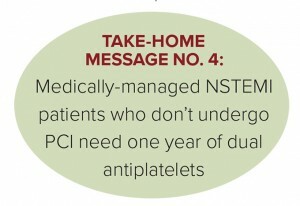 In fact, in addition to NSTEMI patients being medically managed without PCI, all of the following patients have lower rates of cardiovascular events with dual antiplatelets and need at least a year of such therapy: STEMI after PCI or fibrinolytics, unrevascularized STEMI, NSTEMI after PCI, unstable angina, and stable angina after PCI. 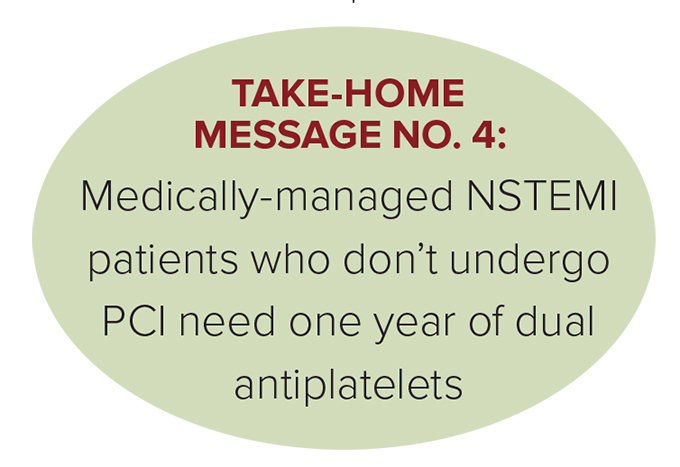 The fact that you need to give medically-managed NSTEMI patients who don’t undergo PCI one year of dual antiplatelets was Dr. Kazi’s take-home message no. 4. As for different antiplatelets, clopidogrel is the most well-studied, and “it is still a great choice,” Dr. Kazi pointed out. It’s also inexpensive and costs about $10 a month. But patients with CYP2C19 polymorphisms are poor metabolizers of clopidogrel, so they “don’t achieve adequate platelet inhibition,” he noted. As a result, they have the highest recurrence rates. Approximately 20% of the general population have loss of function CYP2C19 polymorphisms, but this “varies very dramatically by ethnicity, going up as high as 50% in East Asian populations,” he noted. As for other antiplatelet options: Prasugrel “is extremely potent and expensive.” Because it has a higher risk of bleeding, “you use it only in patients at very high risk of thrombosis,” said Dr. Kazi. “It’s indicated only among STEMI or NSTEMI patients who have undergone PCI.” Prasugrel is also contraindicated in patients with a prior history of stroke or transient ischemic attack because they appear to have an unacceptable risk of bleeding with the drug. Ticagrelor has been studied in all ACS patients, regardless of whether they had PCI. 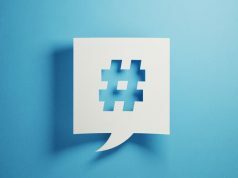 Dr. Kazi pointed out, however, that between 3% and 5% of patients who begin ticagrelor therapy experience subjective dyspnea that is not related to changes in cardiovascular or pulmonary function. In the vast majority of these patients, the dyspnea goes away within 30 days. “You just have to coach them through it,” he said. To choose between clopidogrel and ticagrelor for a year, “base your decision on cost and adherence,” he said. 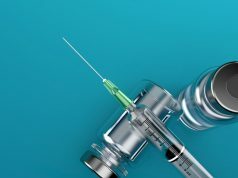 Ticagrelor appears to lower cardiovascular mortality without a substantial increase in bleeding, but it costs around $350 a month. It also requires twice-a-day dosing compared with once-a-day clopidogrel.